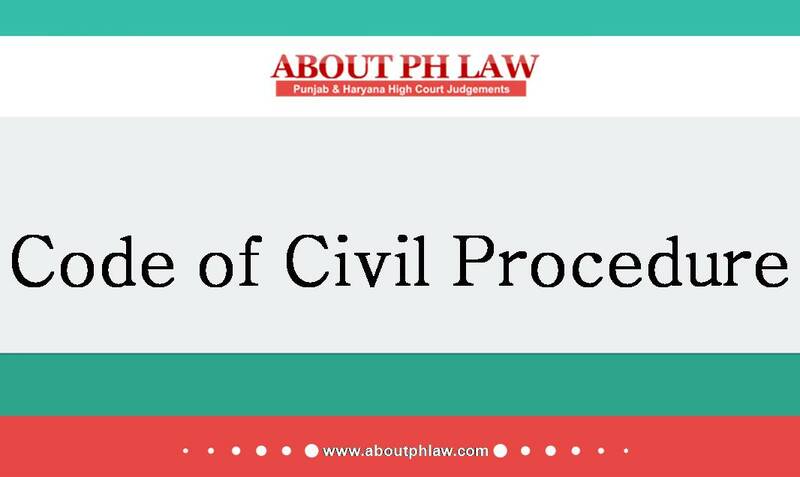 Civil Procedure Code, 1908, O.21 R.102–Execution of Decree– Dispossession-O.21 R.98 and O.21 R.100 shall not apply in a case where the judgment-debtor has transferred the property after the institution of the suit in which the decree was passed. Comments Off on Civil Procedure Code, 1908, O.21 R.102–Execution of Decree– Dispossession-O.21 R.98 and O.21 R.100 shall not apply in a case where the judgment-debtor has transferred the property after the institution of the suit in which the decree was passed. Execution of Decree-Eviction Decree- Objection that tenant has become subsequent purchaser (co-sharer) against whom ejectment order has been passed-Held; Subsequent purchaser against whom ejectment order has been passed, are under legal obligation first to surrender possession of the tenanted property and then seek separate remedy of partition-Objection held to be rightly dismissed. Comments Off on Execution of Decree-Eviction Decree- Objection that tenant has become subsequent purchaser (co-sharer) against whom ejectment order has been passed-Held; Subsequent purchaser against whom ejectment order has been passed, are under legal obligation first to surrender possession of the tenanted property and then seek separate remedy of partition-Objection held to be rightly dismissed. Execution of Decree—Auction Sale—Mere absence of, or defect in, attachment of the property sold shall not, by itself, be a ground for setting aside a sale. Comments Off on Execution of Decree—Auction Sale—Mere absence of, or defect in, attachment of the property sold shall not, by itself, be a ground for setting aside a sale. Execution of Decree—Identification of Property—When the suit has been decreed and the property is not definitely identified, the defect in the court record is capable of being cured. Comments Off on Execution of Decree—Identification of Property—When the suit has been decreed and the property is not definitely identified, the defect in the court record is capable of being cured. Execution of Decree—Partnership Firm—Partners in the judgment debtors firm can be proceeded against individually, only if the conditions laid down under Order 21 Rule 50(2) CPC are satisfied. Comments Off on Execution of Decree—Partnership Firm—Partners in the judgment debtors firm can be proceeded against individually, only if the conditions laid down under Order 21 Rule 50(2) CPC are satisfied. Auction Sale—Without disposing of the claim/objections, the court could not confirm the sale. Comments Off on Auction Sale—Without disposing of the claim/objections, the court could not confirm the sale. Execution of Decree—Part Payment—If the Court does not certify the payment made by the judgment debtor then such payment shall not be recognized by any Court executing the decree for the purpose of giving adjustment to the judgment debtor against the decretal amount. Comments Off on Execution of Decree—Part Payment—If the Court does not certify the payment made by the judgment debtor then such payment shall not be recognized by any Court executing the decree for the purpose of giving adjustment to the judgment debtor against the decretal amount. Auction Sale—To be set aside only where the material irregularity or fraud, has resulted in causing substantial injury to the judgment-debtor in conducting the sale. Comments Off on Auction Sale—To be set aside only where the material irregularity or fraud, has resulted in causing substantial injury to the judgment-debtor in conducting the sale. Execution of Decree—Money Decree passed against husband and firm whose proprietress was his wife—Husband had represented himself to be authorized to act on behalf of firm of his wife—Decree held to be executable. Comments Off on Execution of Decree—Money Decree passed against husband and firm whose proprietress was his wife—Husband had represented himself to be authorized to act on behalf of firm of his wife—Decree held to be executable. Execution of decree—Framing of Issues—It is not incumbent upon the Executing Court to frame issues in every case irrespective of the merits of the objection petition. Comments Off on Execution of decree—Framing of Issues—It is not incumbent upon the Executing Court to frame issues in every case irrespective of the merits of the objection petition.